UPDATE: The Harlem Globetrotters’ game and exhibition scheduled for Saturday, April 17, 2010 at General Motors Place in Vancouver has been canceled. Please click here for more information. It’s no secret that yours truly is a major fan of basketball, so it should go without saying that I was thrilled to learn that the Harlem Globetrotters would be bringing their fiercely talented show to Vancouver this Spring. Despite their name, the Harlem Globetrotters were formed in Chicago, Illinois in 1926 but adopted their moniker due to the team’s association with the African-American community. Since that time, the team has dribbled and dunked their way into countless generations around the world – much in part thanks to that unmistakable whistle of “Sweet Georgia Brown”. When: Saturday, April 17, 2010 at 7:00 p.m.
You can do both and double your entries! The contest closes on April 14th when I draw one lucky winner – Good luck! I wanted to see them the last time they were here but was unable – would love to go this time!!!!! I haven’t seen an exciting dunk in Vancouver since the days since Super Grizz was roaming the courts. I’d love to go see the Globetrotters live at GM Place! Hell, it would be awesome just to see a basketball court in there again. Are they playing the Generals, or the Grizzlies? Wait, was there ever really a difference? I’m a basketball fan and I’m sad to say I never been to a Grizzlies game. Globetrotters are amazing and it’d be so sweet to see them at GM Place. I went to the first ever Grizzlies game and LOVED watching them up close. I have never seen the Globetrotters but think it would be an amazing show and expereince to see basketball on the westcoast again! I’ve always been intrigued and mesmerized by the Harlem Globetrotters since I was a little kid- watching those promo commercials and TSN programs that featured a Top 10 or a news show that had a Play’s of the Week segment. I’ve never really been into basketball too much outside of playing it in elementary school, but I’ve always stopped flipping channels when I saw that distinguishing colour way of the Globetrotter’s jersey’s. Sure, you’re probs thinking that there are tonnes of other worthy candidates, and I fully agree, but in all honesty, if I was to ever see a basketball game or any other thing affiliated, it would have to be the Harlem Globetrotters. I would love to see this basketball team that combines athleticism, theater, and comedy 😀 sounds great !!! Seriously – they’re coming to Vancouver?!? That’s AWESOME! As a kid I was not into sports at all but was always a HUGE fan of the globetrotters. What a kick it would be to see them in person! I think I saw them when I was younger. All I can really remember were their red, white and blue balls. Hehe. I said blue balls. Well I would love to see them, as I am a big fan of them. I seen them in 1978 in Thompson Manitoba. I never get a good reason to get off the rock, and I love you Kierra, and that would be fun. I’m not entering for myself but for my husband (who played basketball in highschool) and my 3 year old son who would love it! I’d love for the 2 of them to go!! Would love to win tickets for my son. We took him when he was small, but he doesn’t remember. Now he’s a teen and loves shooting the hoops with his dad. 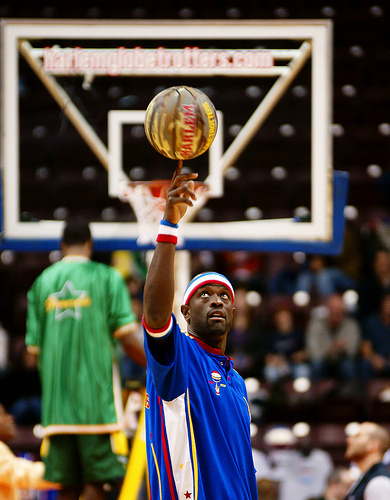 I remember…eons ago…watching the Globetrotters in the Pacific Coliseum and being amaze and even inspired. Their feats of athleticism and sheer joy of performing still linger in my memories quite clearly. My 2 boys haven’t had the chance to see them do their thing yet, but hopefully will get that chance. I’d love to see the Globe Trotters because basketball has been my favorite sport since I was 5 yrs old and I was always mesmerized by their tricks. I am a huge basketball fan and have not been to a live game in a very long time. I want the NBA back in Vancouver so badly! Also, I am the backwards 21 champion of the world and think that I would make a great addition to the Harlem Globetrotters. I would love to see the Globetrotters because I love it when the Man gets a taste of his own medicine. I also have no kids, so I can’t leverage sympathy that way. But ask yourself this. Who is going to support the economy more: a kid who will have a hot dog and a pop at the show, or someone who will drink anywhere between 8 to 10 overpriced beers? For the sake of our economy, and therefore our children, I should be at that show. Oh yes – this will improve my coolness rating with my 15 yr old basketball & baseball playing kid – hook a dude up with some cred! I would love to take my nephew who has been in love with basketball ever since he was a toddler. He has always wanted to play basketball but was unable after being diagnosed with asthma. I would love to see the look on his face when he sees these amazing players perform phenomenal tricks — things he can only dream of doing. and because flight time and big easy were on my favorite show ever, the amazing race !!! I’d love to see the Globetrotters. I missed watching basketball live in Vancouver. My bro and I are huge basketball fans. Would love to see some great dunks in person.